Video players play a critical role in the way publishers content is delivered. Here we dissect nine video players for publishers. Deciding on a video player depends on identifying your publishing needs and prioritizing the features of most importance to your publication. In the following article we explore three main types of players: open source, proprietary and video-sharing networks. Furthermore, we narrow the four components (customization, price, UX, support, and video discovery technology) to focus on when selecting the best option to host your digital media content. The ability to customize your video player gives your website more continuity and allows your user to distinguish your content from other sites. Furthermore, working with a customizable video players gives you the option of showcasing UI finesses, subscription options and also allows you to choose your revenue model. Proprietary — Video players such as Da Cast, Brightcove and Ooyala, allow providers to control everything from skin colors, logo placement and auto-play options. Brightcove’s services even allows you to completely alter the control bar. These services offer customization and have an easy settings interface, allowing almost anyone without a technical background to easily customize the player. Open Source — For open source video players such as JW Player, Video JS, and Kaltura their open source versions allow you to completely customize the skin to your website’s color and feel. Although not as easy to customize as proprietary, the open source allows you to get creative and match your interface. Furthermore, since these players are fully customizable, they permit DRM and state of art encryption techniques, making your VoD platform more secure than video-sharing platforms. You can get even more creative with open source by adding plug-ins such as playlists, timeline chapters, annotations or chrome cast support. For example, Video Player VideoJS boasts more than 50+ plugins. Nevertheless, you must use at your own discretion since plug-ins are risky to install because they come from third party developers who don’t always maintain them properly. Plug-ins are a great extra tool if you have a good tech team in-house. Video-sharing platforms: Websites such as Facebook, YouTube and Vimeo allow you to upload your content directly to their site, making it easy to share and manage content but customizable options can be limited. For example on YouTube you can use parameters, remove YouTube branding, disable/enable autostart, and even remove the YouTube control bar etc. While on Vimeo for its Vimeo Plus users, they can customize their HTML 5 player to change their mark, title, and add outro links. In terms of customizing privacy, Vimeo Plus provides privacy by allowing you to choose who you wish to share your content with. To understand SaaS video players models, publishers need to take into account bandwidth, hours viewed and amount of times viewed. Before choosing the player that is right for you, it is important to estimate the amount of content you plan on hosting and the traffic you expect to receive. Open source: Open source is ideal for large publications who have the right human resources to maintain these platforms. Video players such as JW Player, Video.JS and Kaltura are open source you have to keep in mind the cost of a strong tech team. Although open source is very affordable, when considering this option you have to consider that the client-side player is free (under some conditions) but you have to manage the video encoding, hosting and streaming yourself, which is quite complex. For instance, JW Player is highly customizable, has an integrated API and its open source version is free but you have to take into consideration that you can’t use open source version if you want to stream ads. Proprietary: Proprietary software offers a variety of services but for a price. 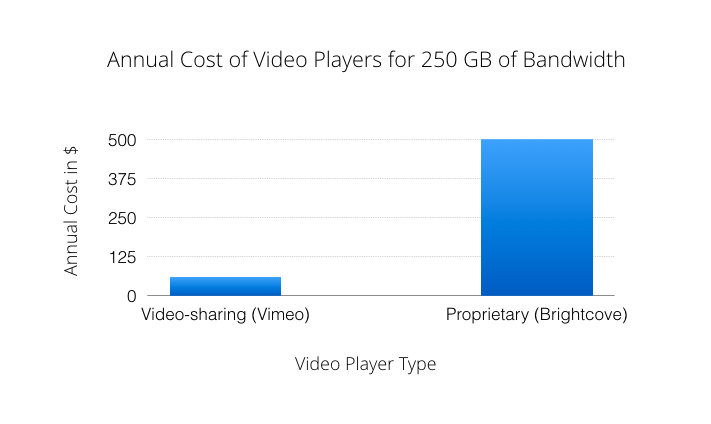 SaaS model video players such as Brightcove, Ooyala and DaCast base their prices on different metrics such as bandwidth, number of average monthly video views or hours viewed. An important step prior to deciding which service to use is calculating an approximation of the income expected from your video content and the cost of bandwidth. Here is a way of figuring out how much bandwidth you might need. Video-sharing platforms: Websites such as Facebook and YouTube allow you to upload content for free. This should be taken with caution since sites such as YouTube take as much as 40% of ad revenue. Other sites such as Vimeo, don’t display ads and allow you to upload a limited amount of content, their VimeoPlus subscription packages give you more bandwidth and Vimeo on Demand gives you the ability to directly sell your content to fans. Although these might seem as cost effective solutions, you could lose potential income from revenue sharing service models. In the following chart we do a comparison between the three types of formats; although proprietary may seem as the most costly options, costs of tech teams, and time saved should be taken into consideration. As video continues to grow publishers are taking advantage of the opportunity to capture more of their audiences. It is estimated that video will account for 58% of all business Internet traffic in 2017, up from 31% in 2012. In order to differentiate content from others, you should take into account how users interact with your digital publications. 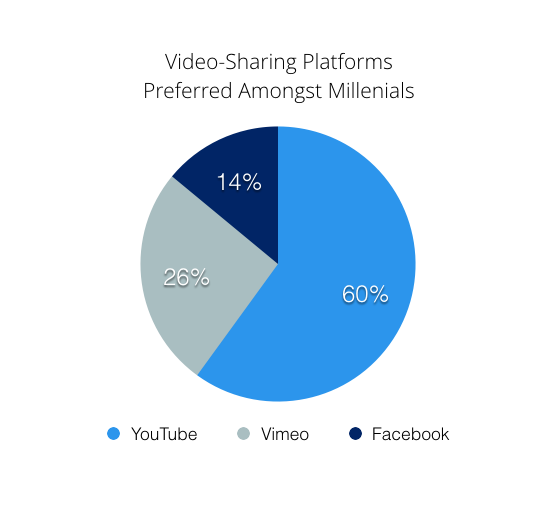 In a recent study done by Pulpix, Millennials said they preferred YouTube over other video-sharing platforms such as Facebook or Vimeo. Understanding where viewers are more likely to engage with content can help you leverage your brand. Regarding UX, publications should also place a large emphasis on what qualities are most important to users. Although many of these factors have to do with internet bandwidth different formats have ways of solving connection issues. Proprietary videos: Video Players such as Ooyala and Brightcove have ways of solving these issues. For example in order to avoid connection issues, Brightcove creates 6 different copies of each video. Each copy is a different size and is optimized for a different connection speed. Depending on the user’s location, video can be served according to their connection power. Proprietary software use top tier international CDNs that effectively deliver content world wide. Furthermore, they offer bulk uploads and provide quick integration and troubleshooting support. Open source: Open source video players such as JW Player also cater to viewers by providing adaptive HLS streaming technology which lets you stream on iOS, on desktop browsers and on Android 4.x. JW Player is compatible with the live and on-demand streaming services offered by all popular content delivery networks. It is important to remember that open source players are built to support streaming technology and different formats but prior to this you need to host the videos on your own server, rather than manually doing this we recommend you use a CDN such as Amazon Cloudfont. Web-sharing platforms such as YouTube also offer adaptive streaming and their video player is accessible on different mediums such as mobile, desktop and tablets. Video Players such as Vimeo and Facebook have not fully integrated quality into their video players and work best with a high internet connection. One thing publishers should keep in mind when uploading content is how to get viewers to engage with their other videos. Open source: Video players such as JW Player and Kaltura allow you to choose recommendation options at the end of their video player and allow you to rotate your content but they don’t offer in-video recommendations or mobile recommendation versions. Proprietary: These service models don’t offer in-video recommendation but are customizable enough to allow you to incorporate these settings. Players such as Brightcove have end of video recommendations which can motivate your viewers to watch more of your content but don’t offer in-video or customizable recommendation features. Video-sharing platforms: Websites such as YouTube offer in-video and end of video recommendations but they might recommend competitors content as well. Sites like YouTube, Facebook and Vimeo are useful for small publishers who don’t have as much content to rotate or as a promotional tool for large publications. A great example of using YouTube as a promotional tool is Vice, the father of “uncomfortable truths,” who leveraged YouTube to turn its publication into one of today’s most popular content creator. Expert Tip: Another great option to rotating your video content is to add your own in-video tool, such as a personalized video recommendation tool such as Pulpix. Pulpix easily integrates on any video player, furthermore you are able to route your users to your own content with our whitelist/blacklist option, add any type of recommendation feature and get insights into your video analytics. “Our service is really easy to install and will help your viewers discover publisher’s deep library content,” says Pulpix CTO Denis Vilar. In order to better understand the kind of solutions different video players can offer, publishers need to prioritize what is most important to them based on their current needs and most importantly their future goals. What video player is best for you? The one that best matches your needs.